Does anyone have a good X52 Pro Profile for SF2E + Exp.2, and willing to share with a tired old man? Well I don't use the default keyboard assignments so sharing my profile wouldnt be much help, however here is an overveiw of my button assignments.....my setup includes a Trackir so I dont have a hat for veiw panning however the mouse on the throttle is for exterior veiw panning. Great job, thanks Romflyer! 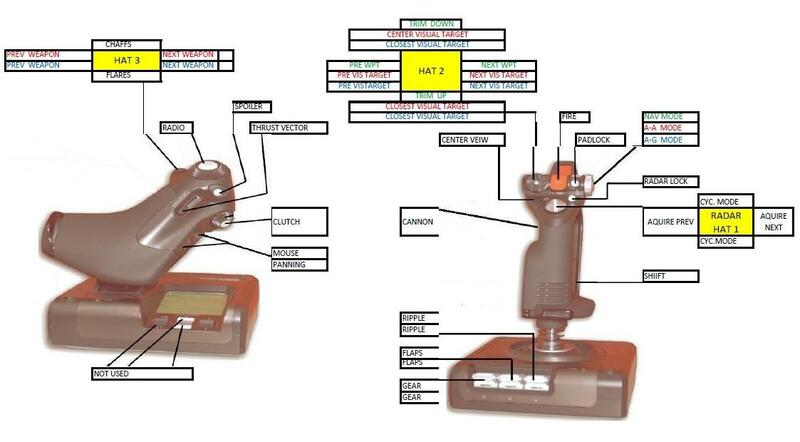 I will try and play with that, I assume that the red/green/blue colored commands on Hats 2 & 3 refer to Mode 1,2, and 3? I am just starting out with SF2E + Exp. 2, so it is hard to anticipate which functions are most useful and convenient in a profile. I also use TrackIR 5. Last edited by Johnost; 10/22/11 08:38 AM. Yes Johnost you are correct regarding the colouring of the modes.....let me know how you make out, and for that matter if you have ideas on improvements to the layout. The X-52 is an awesome devise. To proudly go where STAR TREK fears to tread!